Around here, there are more taquerias than you can shake a stick at. You can walk almost any direction from my front door and hit at least one within 10 minutes, either a traditional brick and mortar or one of the many taco trucks that set up shop in the neighborhood. People choose favorites based on any number of factors. I judge taquerias by their salsa. Most places have the same selection of salsas to choose from after you get your burrito or tacos or whatever. There’s a mild bright red ranchero-style sauce, a deeper red and smoky chipotle version, and a green salsa. 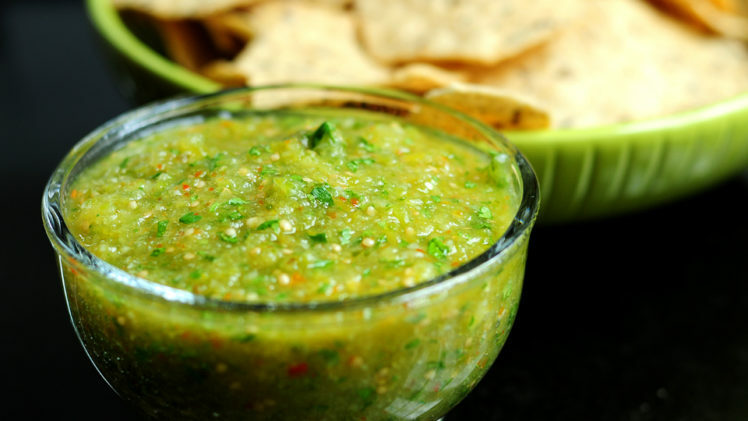 It’s this last one I always dip into first, not because I like salsa verde but because I love tomatillo salsa. I’m always hoping the sweet/savory/tangy flavor of those funny paper wrapped fruits will be what I find. More often it’s the heat of green chiles seasoned with disappointment. 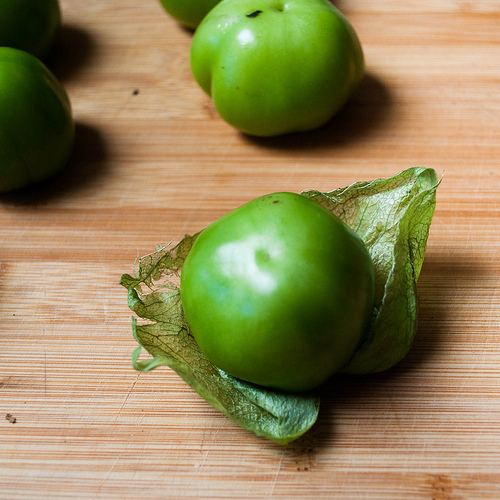 Who knows how this Massachusetts kid came to love tomatillo salsa because we sure didn’t have it where I grew up. There was one taqueria I knew of in Boston and I only discovered that in high school; before that my Mexican food was all El Paso and Tostidos inspired. 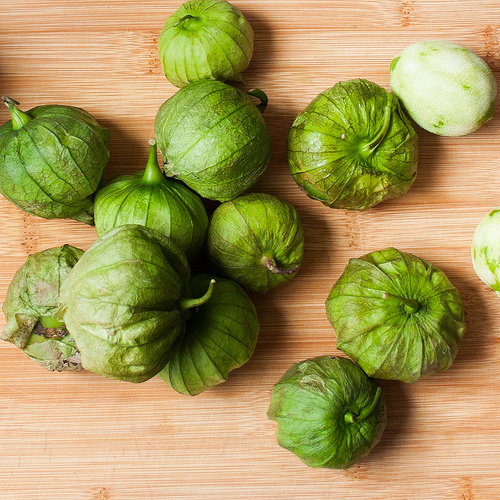 But someone I fell for tomatillos which look like a tomato but taste like something else entirely. I supposed what rhubarb is to berries, tomatillo is to vegetables. It’s a little sweet and tart and it cannot be eaten raw. But cooked with onions and spices into a salsa it’s a pretty perfect accompaniment to your homemade tacos. Or, you know, your take out burrito. I can’t let this post close without mentioning the tragedy that happened earlier this week at the Boston Marathon. Marathon Monday is important all over the state, even to those of us who lived out in the suburbs. It was a day off school for one thing. My dad used to work near the starting line and I know people who live, or have lived, near various points of the race. I even know a few people who have run Boston although thankfully none of them were participating this year. Monday’s events broke my heart, not only because of how much pain it caused that city I love, but also because of how proud I was to see Bostonians rise to meet the challenge and support people who were hurt, physically or otherwise, by the attack. I may be a West Coaster now but Boston is always in my heart. Makes about 2 1/2 cups Alright, so back to this salsa. You have two choices for how to put it together depending on your preferences. 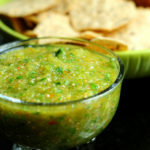 If you like a chunky salsa then chop everything up into a medium dice so that the final product will have some texture. But a) I am lazy and b) I like a smoother salsa so I just roughly chopped it and then blended everything after cooking. Either way works just fine. Place a large non-reactive frying pan (try stainless steel) over medium heat and add the oil. 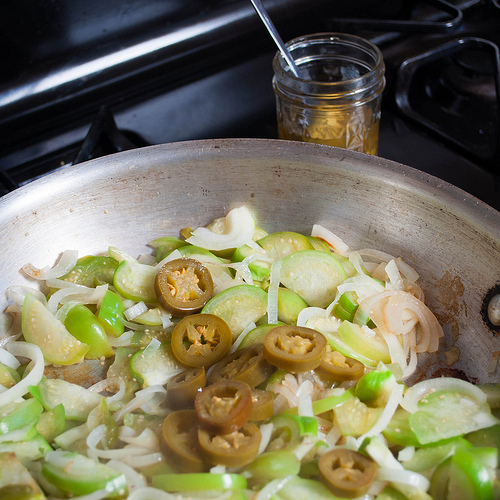 Give it a few minutes to warm up and then add the tomatillos and onions along with a 1/2 tablespoon of the salt. 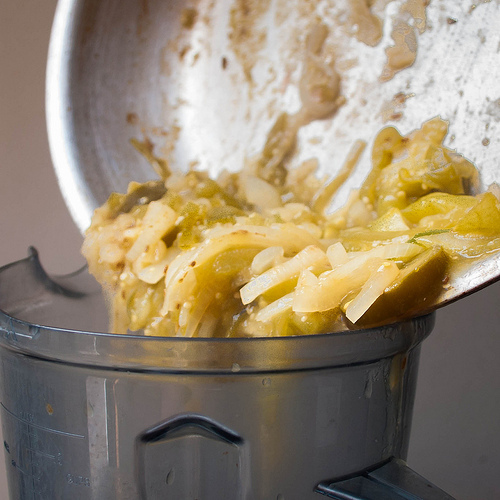 Cook it over medium heat for 10-15 minutes, until the tomatillos start to break down and turn a duller green and the onions are very soft. Add the jalapenos and cumin and cook for another 5-10 minutes until the peppers have softened too. Taste to see if it needs more salt. 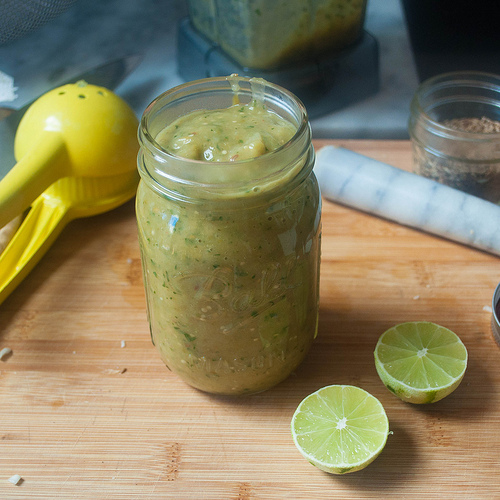 Take the salsa off the heat and add the cilantro and juice of one lime juice and taste again for seasoning. You can add the rest of the lime juice and more salt if you think it needs more. At this point you can blend the salsa to make it smoother or just leave it chunky. Kept in a sealed contained in the fridge, the salsa should keep for up to two weeks. Eat it on just about everything. I pickled a bunch of jalapenos last summer when I got a bag super cheap at a farmer’s market. But you could just as easily use fresh ones. The heat is in the seeds and the ribs inside the pepper so if you prefer less heat, simply remove those things before chopping up the jalapeno. In the summer time, when the weather would get too hot, sometimes my mom and I would blow off everything and head to the beach for the day. We’d stop on the way at a sub shop to grab lunch. Sometimes we’d grab sandwiches at a local chain in town before getting on the highway, sometimes we’d stop at a little deli five minutes from the beach, I always ordered a greek salad wrap (no onions). It didn’t matter where we stopped. If we were going to the beach, that’s what I was eating. As much as I loved that greek wrap, I don’t think I got it any other time in the year. It was specifically for summer, for eating at the beach in the hot sunshine while trying not to get dressing on the book in my lap. As far as beach eats go, it wasn’t the best choice. It was messy and no matter how hard I tried, I always got at least a few mouthfuls that were crunchy with sand. And sometimes the olives in the wrap would have pits in them, a fact I would only discover when I bit down hard on one. But despite their shortcomings those wraps were the taste of summer, of long afternoons on the beach. What I find myself craving now is the barebones of that greek salad flavor. Oregano, lemon, feta, tomato, and cucumber; hold the lettuce please. And skip the wrap too. Have you ever tried to wrestle salad into a wrap like they do at your local sandwich joint? I spent a while trying to do this at my college salad bar with mostly poor results. Either I would rip the wrap and spill salad everywhere, or I would keep it together by using less salad and end up hungry 30 minutes later. 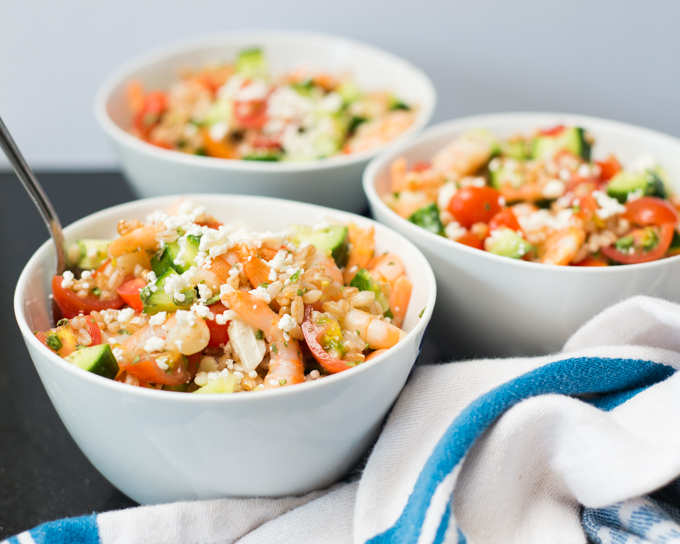 These days my summer greek salad is this bowl, which combines all those flavors with a bit more staying power. And a lot less messy construction. Grain bowls like this are having quite the moment right now. I see them popping up on restaurant menus and in glossy magazine pages. They’re easy, they’re customizable, they can fit just about any dinner need you have to fill. 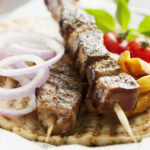 These ones hit all the right notes from those beachy greek wraps (and skips the sand). 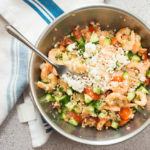 The farro and shrimp bowls are cool and fresh, the kind of thing you want to eat when the temperature gets too high to turn on the oven. Or on those days when you’re still dreaming about summer. BOIL 1 quart of water and when it is boiling, add the farro. Cook the farro for about 20 minutes, until it is tender and chewy. Drain the cooked farro and set it aside. COMBINE juice, minced garlic, 2 tbs minced oregano, olive oil, and mustard in a small bowl or jar and whisk or shake thoroughly. Set the dressing aside. 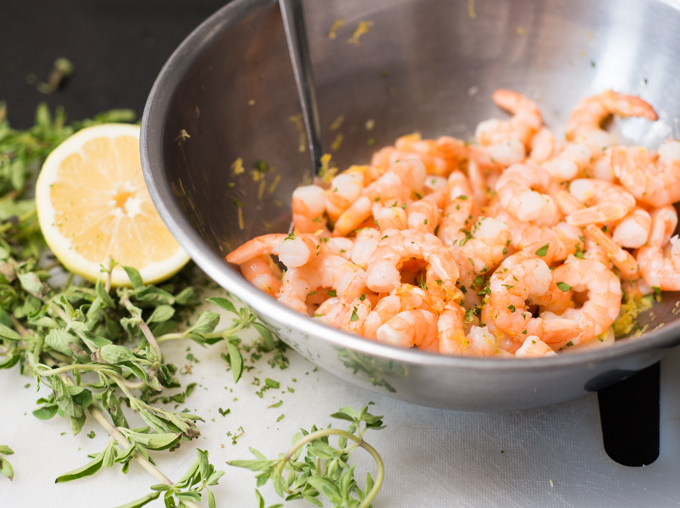 TOSS the shrimp with the lemon zest and the remaining minced oregano. EVENLY DIVIDE the cooked farro among four bowls and top with shrimp, cucumber, and tomato. 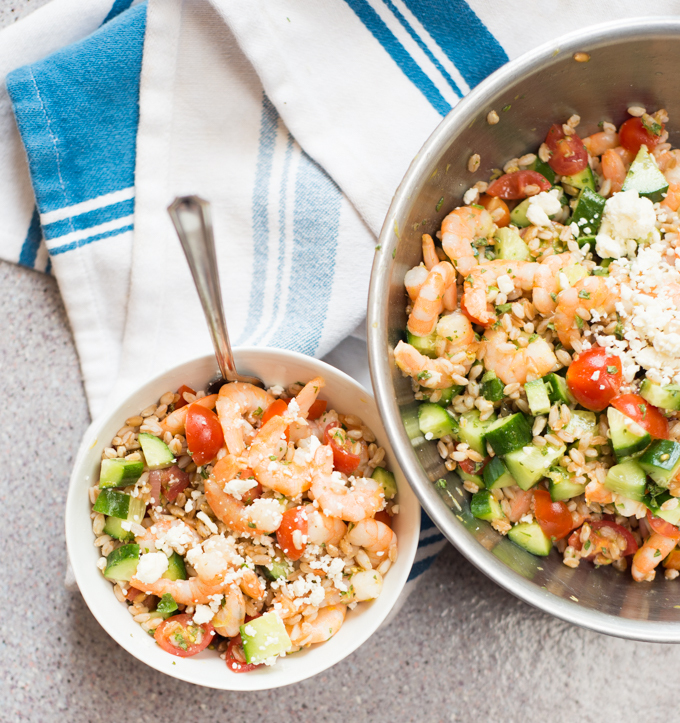 Sprinkled feta over the top and dress each bowl with about 2 tablespoons of dressing. Serve immediately, with any extra dressing on the side. 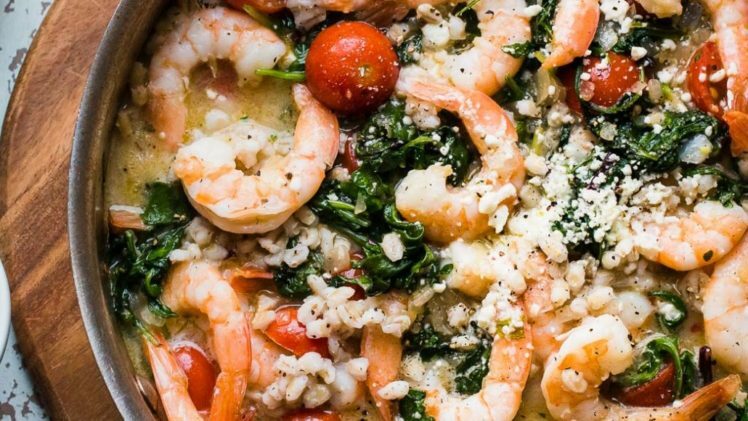 This recipe is infinitely easier with pre-cooked frozen shrimp that can be thawed in cold water (and isn't that the goal of a summer recipe?). But you could also poach the shrimp for 5-7 minutes in simmering water and go from there. You can, of course, also serve this in a single bowl with the ingredients arranged on top, or just toss it all together before serving. The leftovers will keep for a few days in the fridge and make an excellent lunch. It seems that I can’t get through a summer without some kind of corn and tomato combination. This one wasn’t even on my rader. 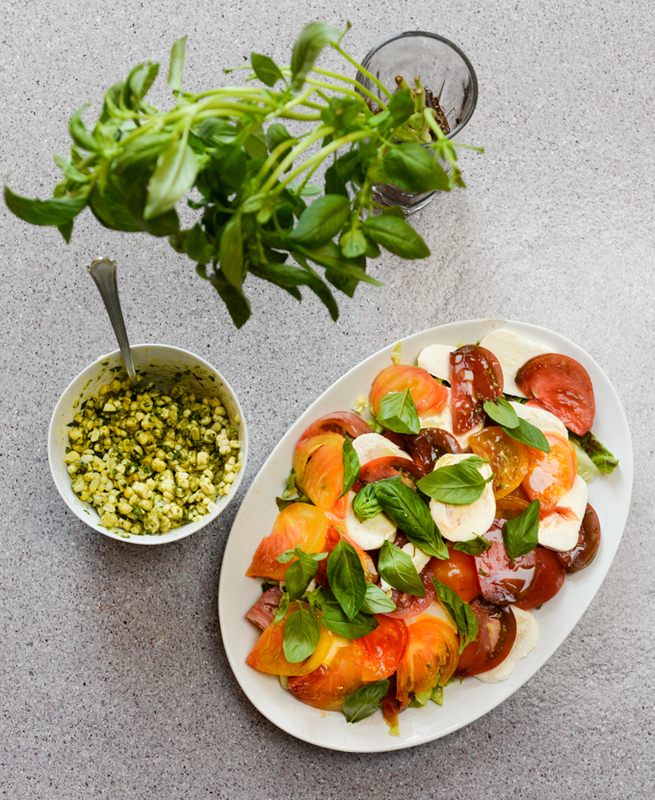 I’d been mulling over the idea of some kind of stone variation on caprese, maybe with peaches, maybe not. I’d gone so far as to buy a tub of fresh mozzarella that had been silently mocking me in the fridge. Last Saturday we headed to the farmer’s market and I fully intended to get peaches for a stab at that salad. And we bought peaches, along with a few pounds of lovely tomatoes, several ears of corn, and incredibly fragrant bunch of basil. The peaches ended up in pie, while the corn and tomatoes ended up in a caprese salad at the end of the day. It was a long day of eating. We devoured half a chicken at the farmer’s market mid-morning and snacked on fruit as we walked around. Mid-afternoon we met up with a friend and walked to a spicy food festival happening a few blocks away, where we stuffed ourselves with wings and soba noodles and nachos doused in various hot sauces, mostly sriracha. The afternoon was capped off with the hottest dish of the day – an unbearably spicy frozen custard sundae. It was topped with a painfully spicy hot sauce that melted into everything as we walked back to the apartment. Two bites was all I could manage and even with three of us attempting to eat it, half the sundae ended up in the trash. The rest of the afternoon was spent sprawled on the couch in an attempt to digest. This salad was born out of a need to have something for light for dinner since we didn’t even start to feel hungry until just after 8 pm. 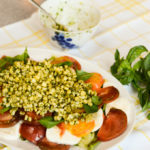 Some of the basil from them market was blended into pesto, corn was boiled and then cut off the cob, tomatoes and mozzarella were sliced and dressed. I served it on greens to soak up the combination of dressing, tomato juice, and pesto that would otherwise have pooled at the bottom of the dish, although if we’d had a loaf of bread in the house, I might have used that instead. The point is not to let any of that juicy, summery goodness go to waste. Soak it up. BOIL a pot of water big enough to hold all the corn and salt it well. Add the corn to the boiling water and let it cook for 10 minutes, rolling the corn around occasionally so that it cooks evenly. Besides looking for a deeper yellow on the kernels, you can tell if corn is cooked if it squirts a little when you pierce a kernel with your fingernail. Once it's done, pull the ears out of the water and let them cool a little. CUT the kernels off the cob - this is where it helps to have half cobs rather than whole ones. The best way to avoid mess is to not cut the kernels so close to the cob; when the knife catches on the cob that's when kernels spray everywhere. Instead, I just follow up with a second cut if I think I've left too much corn behind. 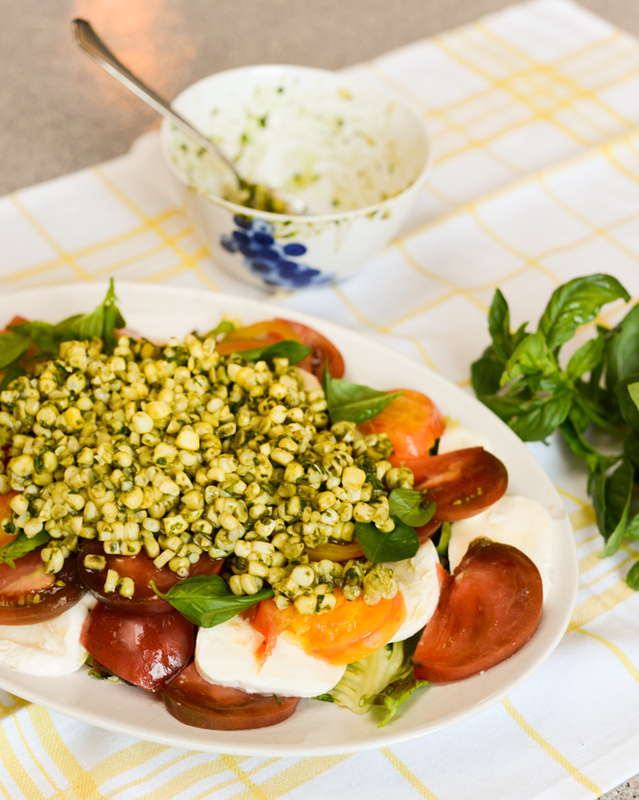 TOSS corn with pesto until well combined, and set it aside. 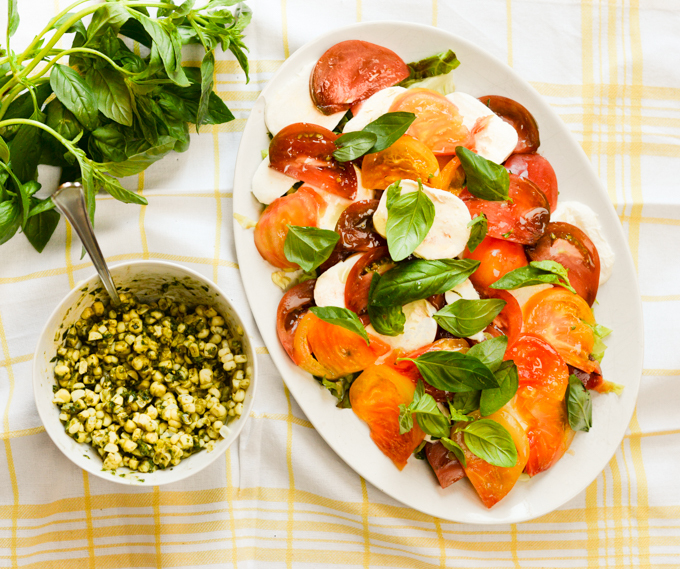 ARRANGE the lettuce (if using), tomato, and mozzarella slices on a platter. Drizzle with olive oil and vinegar and sprinkle with sea salt to your taste. 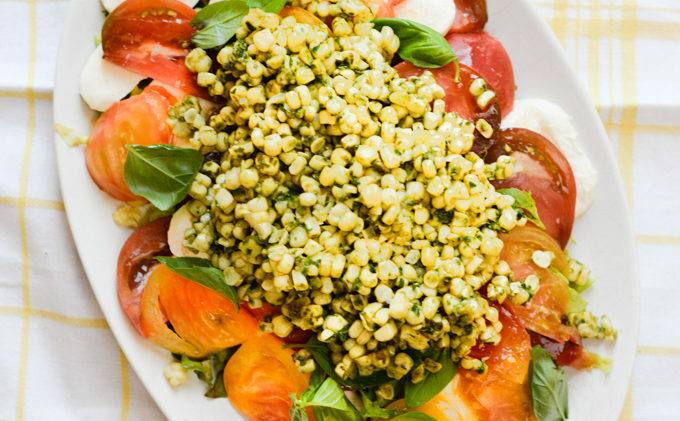 POUR the dressed corn over the salad and garnish with basil leaves. This is best served immediately but I had no problem eating the leftovers the next day. I like the mozzarella and tomato at room temperature and the corn a bit warm, but if it's really hot out I could see serving everything cold to make it extra refreshing. It's just salad. On Christmas, Jeff and I cooked a Thai feast out of the Pok Pok cookbook. We put together a list of dishes to try and spent the week before the holiday scouring small Asian grocery stores for exotic and unfamiliar ingredients. On Christmas day we gobbled up stew and sticky rice and pad thai. The flavors were big and bold and funky, and I loved it, except for the green papaya salad. I had thought it would be a staple recipe, since it was mostly uncomplicated, unlike the other dishes we tried. But it was too funky, too fishy, too unlike the green mango and papaya salads I love. It bore only a passing resemblance to the one in the photos. When we go out for Thai food I will order a green mango or green papaya salad (is there a difference? I can’t tell). Or at least I will think about ordering it, and try to convince Jeff we should get one. I love the crunch and the sweet/tangy fruit with the tart/salty dressing. But confronted with a more authentic version, I ate a few bites and then left it on my plate. Which made me wonder if it was worth recreating the restaurant experience at all, or just using it as a starting point to create something different. I chose option B. Part of my reasoning is that green papayas and green mangos are a pain to find. They require a trip to a different grocery store, and I have no idea if I’m picking a “ripe” one because, you know, I’m buying a fruit that is intentionally sold when it is not yet ripe. I just avoided the problem entirely, opting to build my salad around ripe mangos. At least that way, I have some idea when I’m getting a good one. Mangoes are one of those fruits that doesn’t seem to have much seasonality because it’s always in the grocery store, even if it’s only in the freezer aisle. 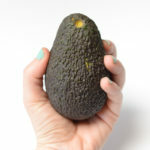 But I recently learned that they hit their season, at least in the Northern Hemisphere, in early June and are ripe through the middle of the summer. Not that they’re a local fruit, mine are trucked in from Hawaii, I think. But during that short season, they’re totally worth the splurge. 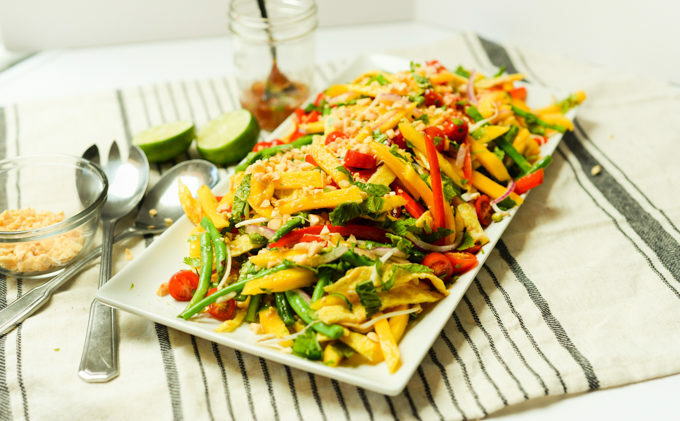 And while you could just cut them up to eat raw, or make one-ingredient ice cream (still really want to try that) or a delicious grilld cheese, at least a few of them should end up in this Thai mango salad. 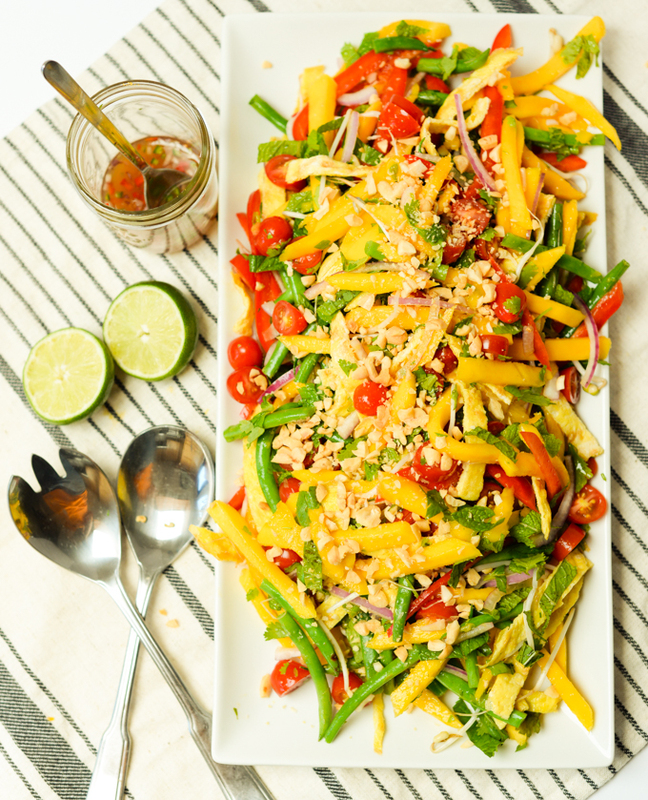 As long as I was ignoring the actually-from-Thailand recipe sitting on my bookshelf, I figured I had license to do whatever I wanted to make this salad easier/better/more delicious. I opted to leave the mango in larger pieces instead of wrestling the ripe fruit into neat julienne strips – good choice. 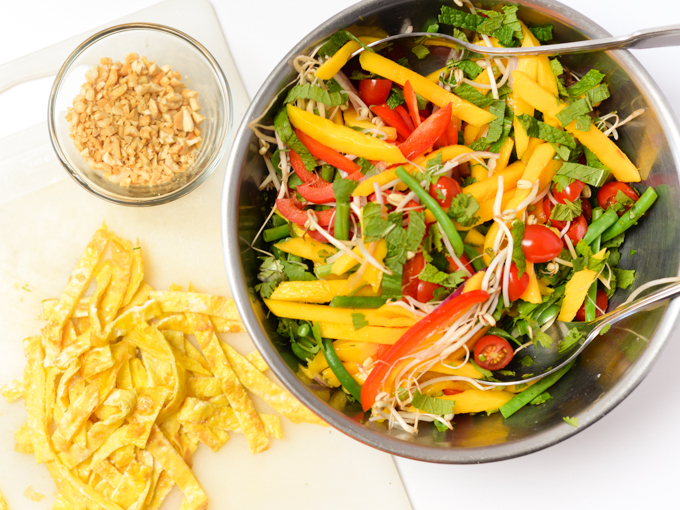 I added strips of scrambled egg to make this more of a dinner salad while still keeping it vegetarian – great choice, that scrambled egg is so good! And I used a simple Thai-flavored dressing, rather than trying to spice it up with exotic ingredients that I’m probably not going to have on hand most of the time. 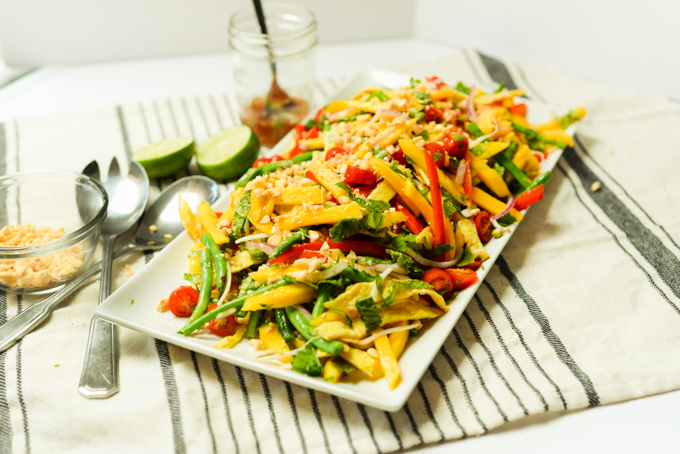 So this is not like the mango salad at your local Thai restaurant, and it’s probably not like one that you can get on the streets of Thailand either. But it is one I can put together in half an hour with ingredients I can get at the local store. The hardest part is picking the ripe mangos. 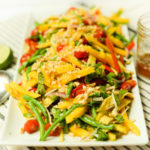 COMBINE chopped mangos, red pepper and onion slices, green beans, bean sprouts, tomatoes, cilantro, and mint in a large serving bowl and toss to combine. WHISK the eggs with the fish sauce (or soy sauce, if using) in a small bowl. Heat a nonstick pan over medium heat and add a half teaspoon of oil. Add the eggs and more the pan around a bit to get an even layer of egg on the bottom. Let the egg cook for 2-3 minutes, until it's set and has little brown spots on the bottom. FLIP the eggs to cook the second side - you can either try the wrist-snap-flip (always good to practice!) or just slide the eggs onto a plate and flip them back in to the pan, uncooked side down. Cook for about another 2 minutes, until both sides are lightly brown. Remove the eggs from the pan and let them cool for a minute or two. SLICE the egg into strips about a half inch wide and 2 inches long. ADD scrambled egg and dressing to the salad and toss to combine. Taste, and add more dressing if needed - I like to start out with a few spoonfuls and then add more if I want it. Sprinkle the chopped peanuts on top and serve. 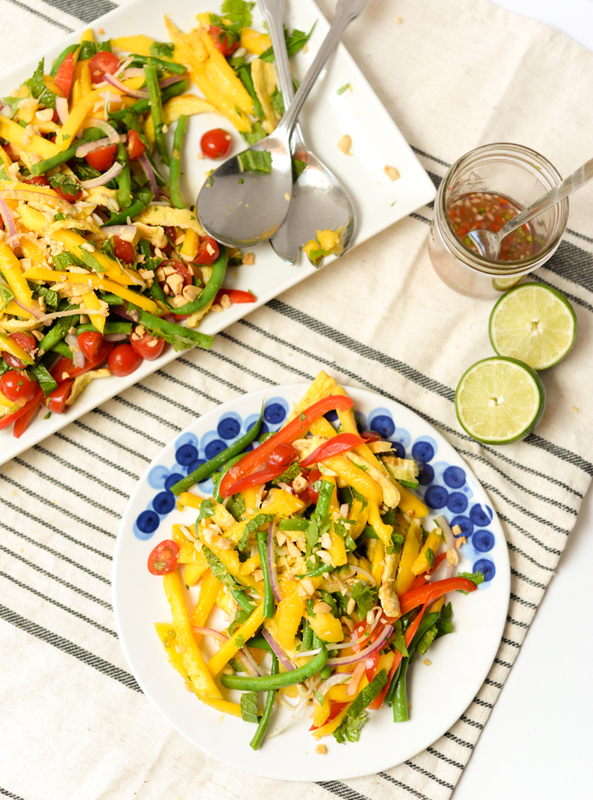 This salad is best when you serve it right away, but it lasts for a few days in the fridge without a problem. You can steam the green beans if you prefer them cooked. Either steam them over a pot of water heated on the stove or microwave them with a few spoonfuls of water for a couple of minutes. You can also use frozen-and-defrosted green beans, so long as you drain them well as defrosting them. This was a close one. I almost let April pass by without a grilled cheese recipe. For those of you keeping track at home, April is national grilled cheese month and in fact there’s a grilled cheese day somewhere in the 30 days of this month. And, as we’ve established, I get a kick out of celebrating fake food-related holidays. Plus, who doesn’t love grilled cheese? Sure, it’s the second to last day of the month but at least we can say we got this one in, right? 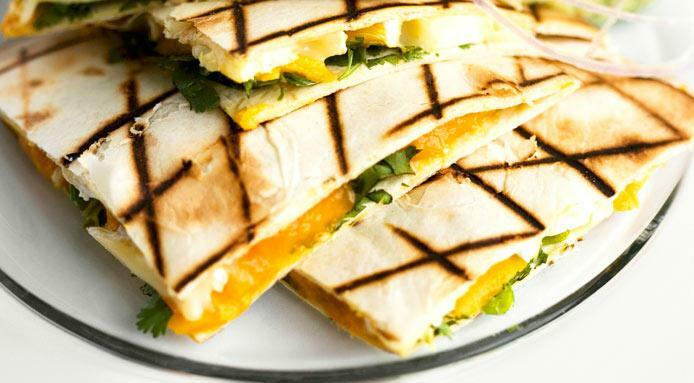 About this sandwich: you may have noticed it’s not called mango and brie grilled cheese. That’s because I didn’t come up with it myself. My college had a small cafe that, aside from coffee and pastries, also had a rotating menu of vegetarian lunch items that it served during the week. Some were good and some were only good if you were a vegetarian, but on the day they served mango and brie paninis the line started early and lasted until they inevitably sold out a few hours later. I ate my fair share of them, especially considering that they only were around one day a month. What made them so amazing? Maybe the fruit and cheese combination or the fact that it was my first exposure to sweet and savory grilled cheese. 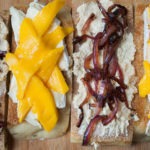 Maybe it’s the caramelized onions, which are phenomenal, or the slippery mango slices, that get a little caramelized on the edges. Maybe it’s just that grilled cheese is so good. Before I had the forehead-realization that I could make these at home, it had been years since I was around for mango-and-brie-panini day. Turns out that it’s just as good at home, not to mention that there’s no line and you can have two if you want to. If you are something of a grilled cheese purist, this might be a bit of a stretch. There’s a lot going on in this sandwich and a fair amount of it isn’t cheese. But the end result is gooey and melty and golden brown on the outside. The edges are crispy and it’s really messy when you bite in. It was worth the wait. In a small bowl, combine the cream cheese and the chutney. If the cream cheese isn’t soft enough you’ll end up with some pieces of cream cheese that won’t combine which, while a little unappealing looking, is fine for the sandwiches. Spread one side of the bread with the cream cheese mixture and top with the caramelized onions. 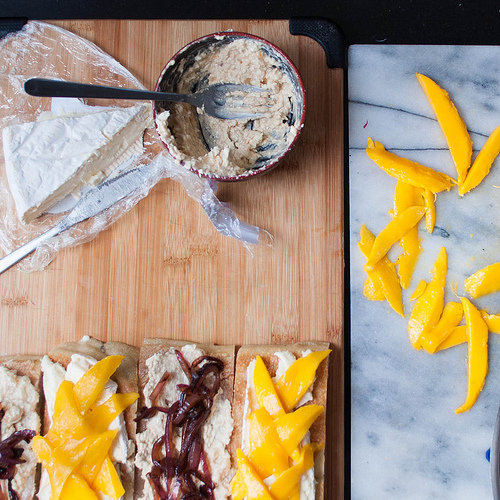 On the other side of the bread, lay down the brie slices and press the mangos into the cheese. Sandwich the two halves together and butter the outsides of the bread. Heat a pan over medium heat and if you have it, heat a second cast iron pan to use as a press (or use a panini maker if you have one). Place the sandwiches in the pan and fry for 3-5 minutes, until the bread is toasty and brown. Flip the sandwiches and place the second pan on top to press them down. Cook about another 5 minutes until the second side is brown and the cheese is gooey. 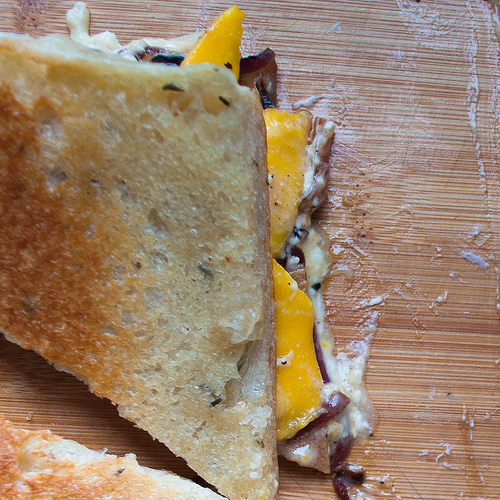 This is a messy sandwich but there are two ways to cut down on the gooey-ness. 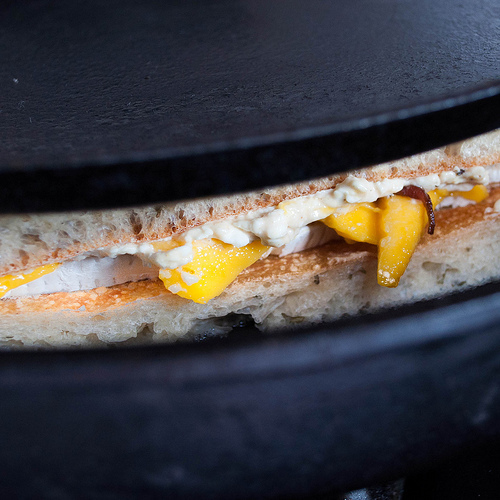 You can hollow out the bready inside of a roll (only on one side) to create a little pocket for the mango and cheese. Or you can use large slices of bread and leave a half-inch border around the edges so the filling to spread into as it melts. I opt for just a messy sandwich and a big napkin. I keep my container of kosher salt next to the stove so that it’s easy to sprinkle some on while I’m cooking. 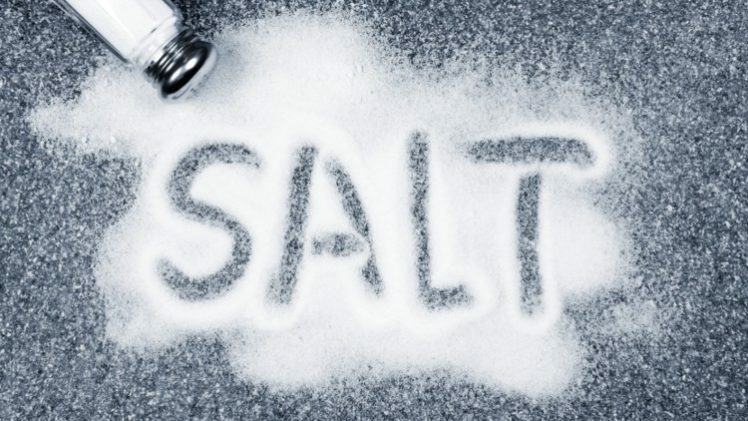 In fact, one of the first questions Jeff or I will ask when we wander into the kitchen while the other is cooking is “Have you salted that?” It’s not that we’re salt fiends – ok it’s not just that we’re salt fiends – but salting during cooking is much more important than salting at the end. Often cookbooks and chef recipes refer to salting food as seasoning it, and that’s just a semantics thing. Salt plays two roles in food: to season it and to make it salty. Those crystals of salt on your potato chips are doing the latter job, but the salt you add to during cooking does the former, and that’s way more important. To understand why, you have to know a little about how you taste salt. In small doses salt helps cover up bitter flavors. That’s why baked goods always call for a little bit of salt. The end result doesn’t taste salty, but it does taste more flavorful. A little salt early in the cooking process makes vegetables more savory and chocolate more fruity. It’s when you sprinkle salt on a dish after cooking that you end up with something that tastes salty. That’s not to say that you should salt your food with abandon. But adding it early will result in food that tastes full of flavor rather than full of salt. If you open any freezer in America, chances are good that you will find a frozen pizza. Or maybe that was just a 90s thing. The one you would find in my parents’ freezer circa 1996-2004 was Celeste. 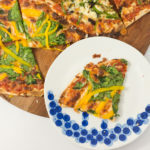 It’s a single-serving bar style pizza with a crust that’s not thick or thin, and the cheese goes out all the way to the edge of the pie. It gets a little crispy on the edges, or at least it might have if I hadn’t cooked it in the microwave It looked great on the box and it tasted… like frozen pizza with a heavy dose of oregano. I’d completely forgotten about them until I saw a picture of a homemade pizza that looked just like what was on those boxes. I immediately emailed my brother the picture and he agreed that this homemade version looked just like what we grew up with. And from there, I pretty much had to make one. You see, you would not find a pizza in my freezer. Not because I have anything against frozen pizza. 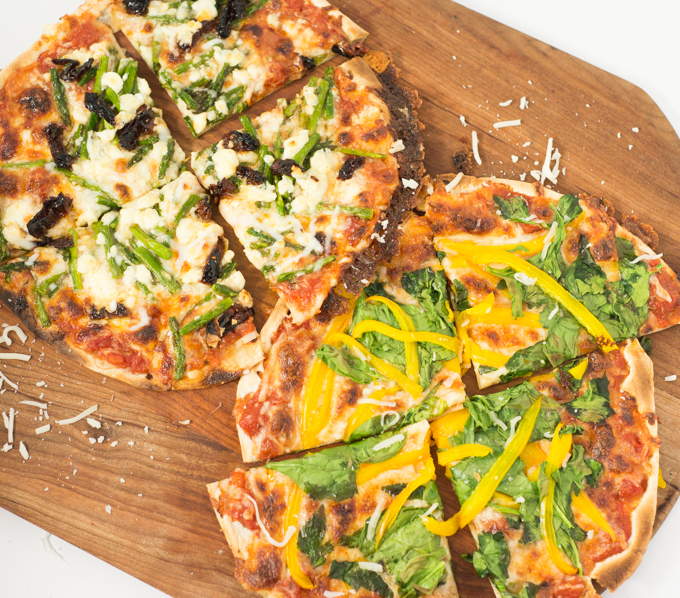 It’s pizza – even when it’s not very good, it’s still good. No, my freezer is pizza-less because it is too small for pizza. Thanks to the steeply sloped ceilings in my apartment, both the fridge and freezer live under my kitchen counter, and the freezer is too shallow for a pizza box (seriously, we generally have to shuffle to fit a bag of frozen dumplings in there most weeks). Satisfying a last minute pizza craving meant spending a while wrangling dough or ordering takeout. Well, no more. I was skeptical that a tortilla with sauce and cheese would taste like a pizza, but the results were better than the Celestes I used to heat up in the microwave. This is not that microwaved pizza with a soggy crust and weirdly unmelted cheese. (Did you notice that on microwave pizzas? The cheese doesn’t always melt.) This is a good pizza. 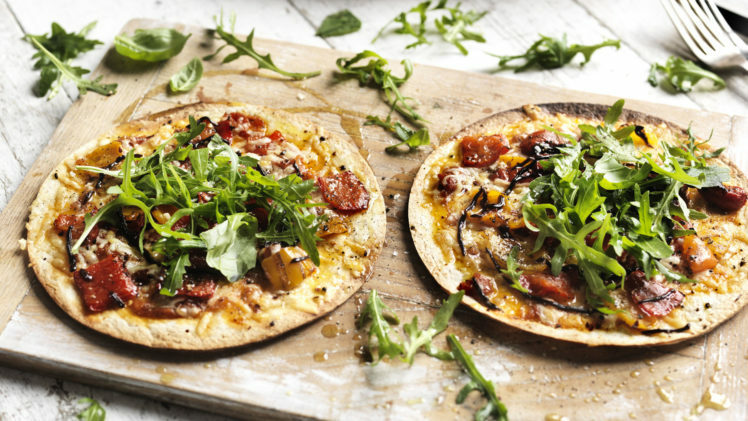 The hot pan gets the bottom browned and crispy, the cheese gets brown and bubbly, and in a few minutes you have a pizza that serves one. I load mine up with vegetables to enhance the pretense of healthiness. I can’t promise that I’ll avoid frozen pizza forever. At some point we’ll have a full sized freezer again (fingers crossed), and you may find a pizza in there. But I don’t think I’ll ever give up this pizza either. It’s crispy, made-to-order, and relies mostly on fridge and pantry staples. Ad for the oregano in the recipe – it gives it a Greek-American style that reminds of the first pizza I can remember eating (and the place is still open!). If you haven’t had pizza like this, now is the time. And if you come up with any good topping combinations, let me know. I’m always up for pizza. PREP all your toppings before you start. This recipe moves fast so you need to have everything ready. TURN on your broiler - if you have a choice of settings, choose the High setting. Adjust a rack in the oven so that the pan will be a few inches from the flame. 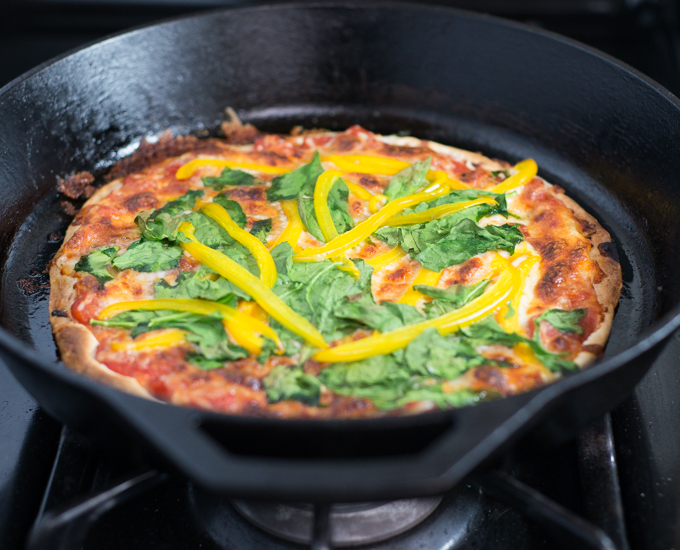 HEAT the oil in an oven-safe skillet (cast iron or thick-bottomed stainless steel are good) over high heat. After about 3-5 minutes, when the oil starts shimmering, add the tortilla. ADD your toppings to the tortilla (cheese that goes off the edges will get extra crispy) and turn off the heat. BROIL the pizza for five minutes, or until the cheese is melted and brown in spots. Remove it from the oven and use a spatula to transfer it to a plate. This pizza is best when it's hot and fresh so eat it as a quickly as you can (while avoiding roof-of-mouth burns). The town over from where I grew up had a bakery that made a particular fruit tart. You know that kind I mean. The picture-perfect, glossy fruit tart with a thick and sweet pastry cream under the fruit. It made a regular version during the year, but on Passover it made a kosher-for-Passover version that was surprisingly delicious given the sad state of kosher-for-Passover desserts (I’m looking at you, macaroons in a can). 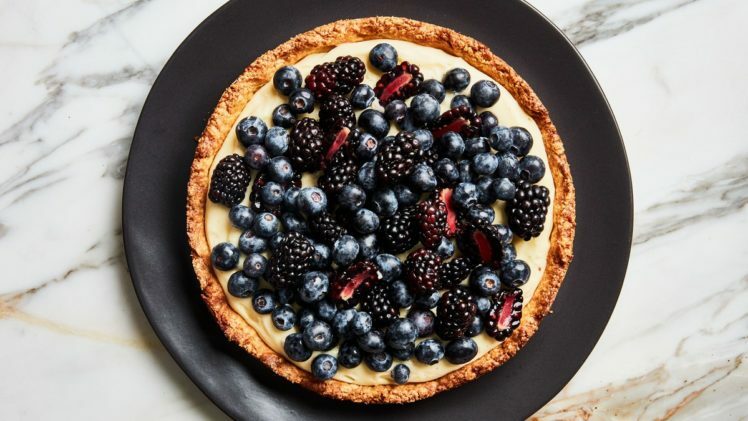 We almost always had at least one during the holiday, at a Seder or for my brother’s birthday when it fell on Passover, and sometimes we had it more than once if people had not properly coordinated who would buy the fruit tart. And then at some point, the bakery disappeared. No more fruit tarts. My memory is that the owners disappeared to Florida and there was some scandal related to taxes, and while I’m not sure how much of that is true and how much is my tendency to embellish memories, I’m sticking with it. It’s just so much more intriguing to think the kosher bakers hightailed it to Florida to outrun the long arm of the law. Besides, the details of why the bakery closed down isn’t really the issue. The issue is that there is no more kosher-for-passover fruit tart, or at least there is no more of that particular one. When I originally thought of doing a YearOfPie, I thought this would be my chance to make that pie. 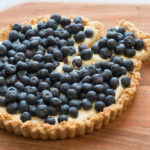 But fruit tart usually comes with a pastry cream filling, sandwiched between the crust and the fruit topping, and I couldn’t bring myself to make pastry cream or to pretend that it was worth making. 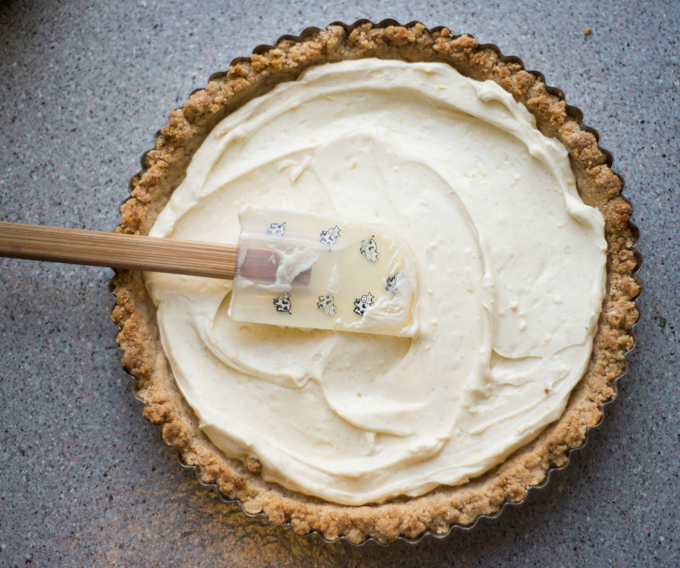 Pastry cream requires a fair amount of time and attention to put together, since it needs to be carefully cooked until it will set firm when cooled, but is still lump free and not scorched. Add to that the fact that it mostly tastes like vanilla pudding, and it wasn’t worth the time to attempt it again. COMBINE the almond meal, butter, sugar, and salt in a medium sized bowl until well combined. PRESS the almond mixture into the prepared pan. It is a bit sticky so it helps to grease your hands or the bottom of a glass when you're forming the crust. Sometimes I level off the sides and sometimes I leave them craggy and imperfect. CHILL the crust for about 30 minutes in the fridge (or half that time in the freezer). Dock the crust with a fork. Preheat the oven to 350 while the crust chills. BAKE the crust for 20 minutes or until it is golden brown. Let it cool to room temperature, at least an hour. WHISK softened marscarpone, yogurt, honey, sugar, vanilla, and salt in a large bowl until well incorporated, about 3-5 minutes. 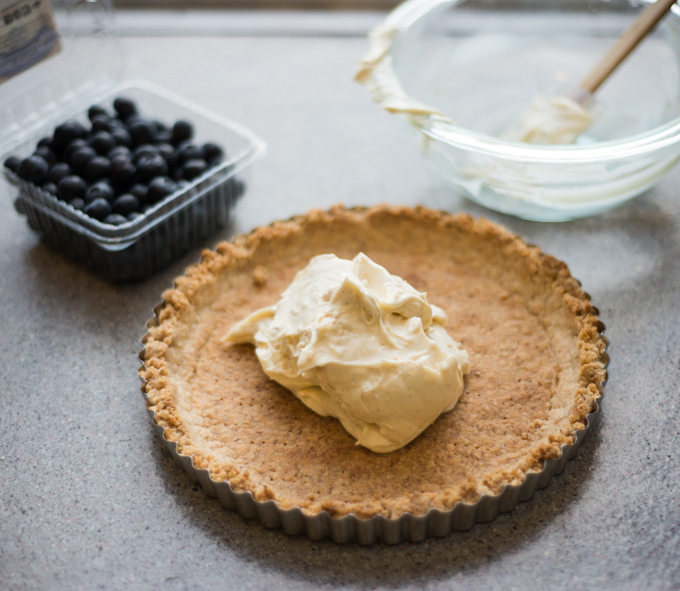 Do this by hand since using a machine will likely result in overbeaten-and-curdled marscapone. It doesn't take much effort to whisk it together. SPREAD the marscarpone filling into the almond crust to form an even layer. 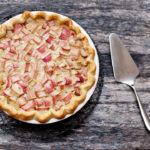 Top with your fruit of choice.Serve the pie within a few hours of putting on the fruit, especially if you use sliced fruit. You can keep the crust-and-marscarpone filling in the fridge, covered, for a few days. 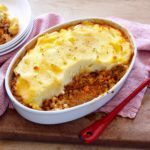 And the baked crust can keep in the fridge for a few days or the freezer for up to ten days. If this crust looks familiar, it's essentially a graham cracker crust with almond meal swapped in for graham crumbs. I don't know why this isn't more popular on the Internet, but at least now you have it too. When I was a kid, it was called schwarma because it came mostly from Middle Eastern restaurants. And then when I spent a college semester in Australia it was called doner kebab, the Turkish name. And now in San Francisco they’re mostly called gyros, even if the place where you get it isn’t Greek. For a while I ate one just about every week after playing Ultimate Frisbee in the park. It’s a good sandwich – saucy and packed with crisp vegetables. Sometimes there are fries or feta or other additions but the real stunner is the meat. The vertical spit is sort of weird and sort of wonderful, and it’s generally looks the same no matter what you call the resulting sandwich. The rotisserie slowly spins and the strips of beef or lamb or chicken caramelize on the outside until they’re sliced off for folding into a wrap. And on top of that there’s usually an onion or two, its juice slowly dripping onto the meat cooking below. At my favorite place, there’s a small pile of tomatoes roasting under the meat as well, soaking up everything above them. A few of those get stuffed into each wrap and those juicy bites are the best part. I always loved watching the rotisserie as it makes a slow revolution, each side getting a chance to sizzle by the heat, and then turn away to avoid burning. I still like watching it while I wait for my sandwich. The rotisserie put gyros in the category of things I assumed couldn’t be made at home. I’m not buying a rotisserie, and while it might be fun as a weekend project with friends, I figured I was better off getting takeout than trying to MacGuyver gyros on a weeknight. I probably would have stuck to that idea if it wasn’t for those tomatoes. Soft roasted tomatoes mingled with roasted meat seemed too delicious not to make at home. And from there I thought about what spices would go into something that tastes like a gyro. And from that perspective, homemade gyros didn’t seem so impossible. It may not be the authentic rotisserie, but then again, meals don’t have to be authentic to make a damn good homemade weeknight dinner. 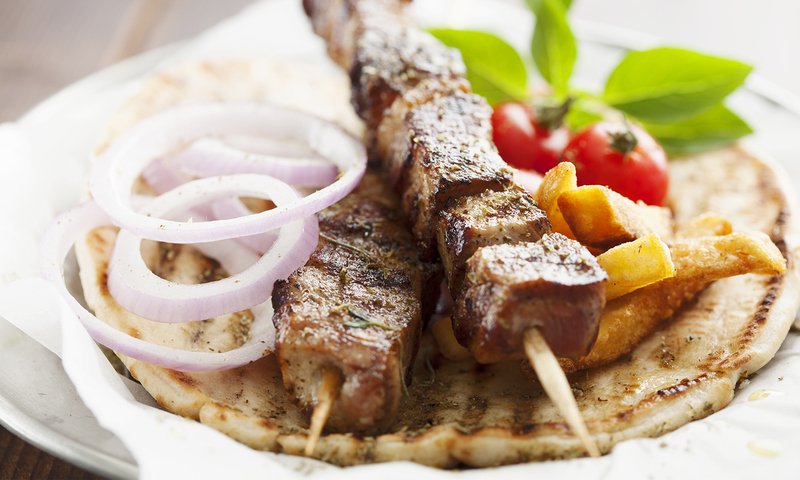 These skewers are all the flavors of a gyro, hot and herbal and garlicky. 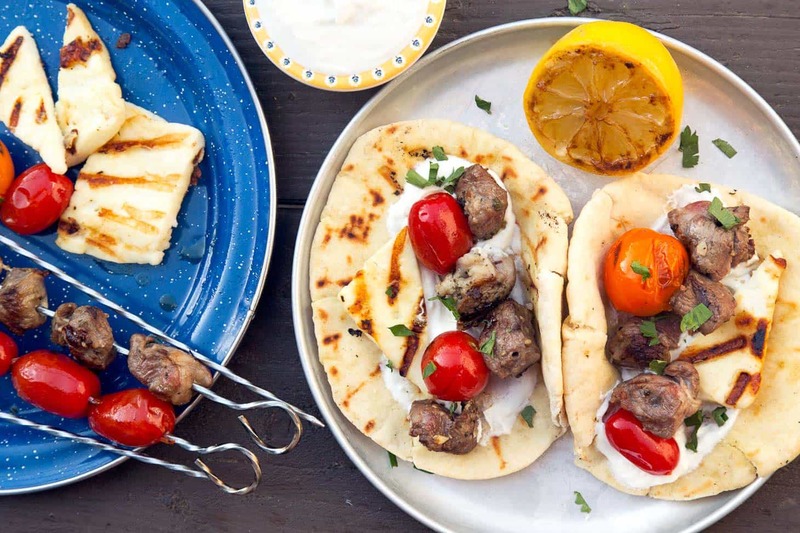 We ate the meat and the soft juicy tomatoes with fresh pita bread and poured tahini yogurt sauce over each bite. And it was delicious, just like gyros at the little takeout joints all over the city. If you use wooden skewers for this recipe, be sure to soak them in water for at least a half hour before using them or they will burn. COMBINE the yogurt, tahini, garlic, and a half teaspoon salt in a small bowl. Mix it thoroughly and then set it aside. SKEWER the meat and tomatoes, making sure each skewer has at least two tomatoes on it. This will take 6-8 skewers, depending on how long they are and how much you want to put on each one. PREHEAT the grill to a medium high heat or turn your broiler on high and set a rack to the second-closest position from the flame. COOK the skewers for about 12-15 minutes, turning them every 2-3 minutes until the meat is cooked through and the tomatoes are charred on all sides. 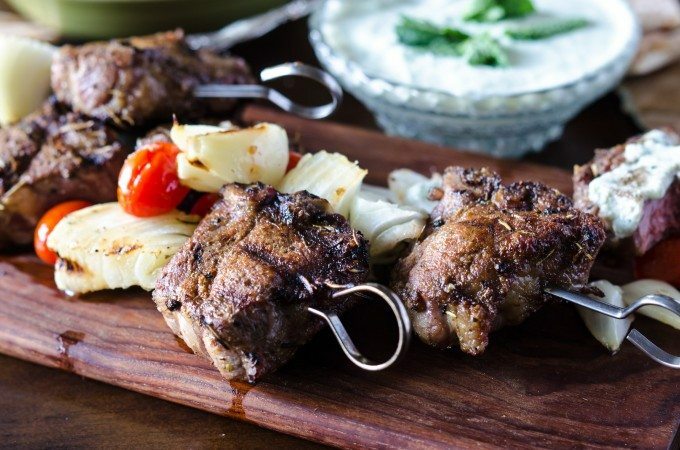 If you are using the broiler, cook the skewers for about 20 minutes, turning them every five minutes.Serve the skewers with pita bread or maybe some sauce, and douse everything liberally with the tahini garlic sauce. The leftovers will keep for about a week in the fridge and they're excellent reheated for lunch. The temperature for cooking meat to "medium" is about 135F for beef and 140F for pork. The Superbowl is one of the best food holidays. In the same way that on Halloween girls can wear basically nothing and call it a “costume”, on Superbowl Sunday you can make something obscenely unhealthy and call it a “snack.” And then you can spend the rest of the afternoon eating a dinner-sized portion of said snack. It’s kind of like magic and it’s a magic I love taking advantage of despite my total lack of football interest or knowledge. In past years I’ve made reuben dip (sadly undocumented, but so cheesy and creamy plus slightly tangy from sauerkraut), buffalo wings (in baked form and turned into a dip), and a full scale snackadium (inspired by these awesome renditions). 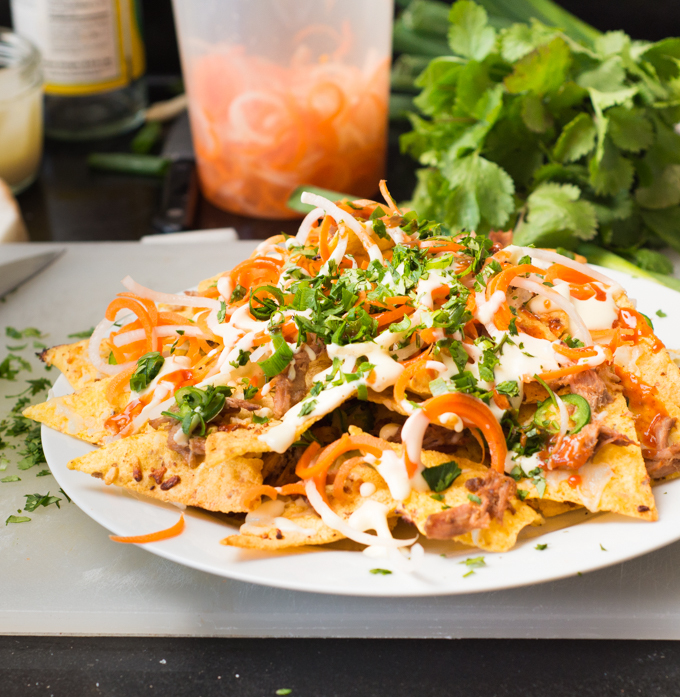 And this year’s goal was to up the ante on nachos by making them bahn mi style. 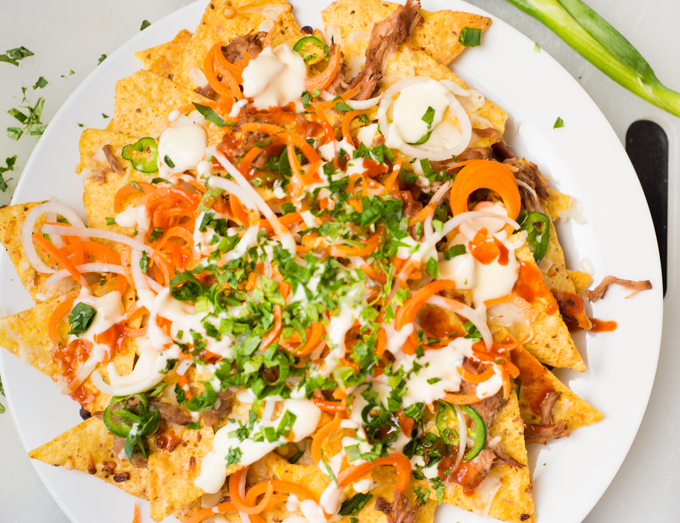 Back in July someone posted a comment on Facebook, bemoaning the lack of bahn mi nachos in the world. The gauntlet was thrown, and it only took me about six months to figure it out. Here’s the thing: I’ve eaten a lot of bahn mi. A LOT. When I was in law school I probably had about one per week, from a little hole in the wall near campus with perhaps the best bahn mi in the city. I started with the tofu variation but by the end of law school I’d eaten almost every bahn mi on the menu and tried a handful of other varieties at different locations. And while it’s been a few years since I ate those sandwiches with borderline obsession, it wasn’t a stretch to figure out how the flavors could translate to nachos. The components of a bahn mi aren’t too complicated: some kind of cured meat, cilantro, a mix of pickled carrot and daikon, mayo, and crusty bread. Jalapeno slices often show up (which I left in), as does pate (which I left out; it just seemed too weird). The cheese was more difficult, to add or not to add? 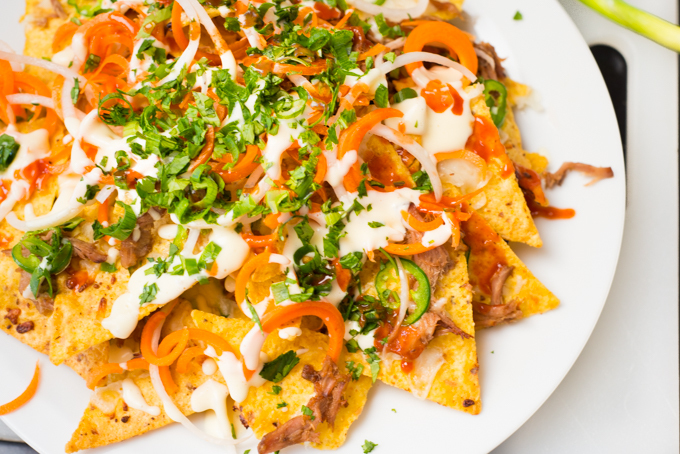 Vietnamese food doesn’t really use much dairy but nachos need cheese, and in the end it worked out remarkably well. Savory and sweet and creamy, with spicy bites when you get a jalapeno – the issue of which bite will burn your mouth is a key part of a bahn mi where only some bites have jalapeno, and those bites are a doozy. Jeff and I devoured the first batch, standing up at the kitchen counter listening to the first episode of Invisibilia (have you heard it yet? I love it!). We just stood over the plate, shoveling chips into our mouths, silently except for some sniffling when the jalapenos got the best of us. The plate was empty before the episode was over. The second batch actually made it to a football game and it was gone almost as quickly. It’s messy and a bit over the top and just the kind of “snack” for the Superbowl*, because any other time, these are just ridiculous. In the good way, of course. TOSS the shredded pork of chicken with the hoisin sauce and set aside. ARRANGE a few handfuls of chips into a single even layer on the sheet – use as many as you need to get a single full layer. Sprinkle over the top ¾ cup cheese, ¾ cup of the pork or chicken mixture, and about a third of the jalapeno slices. Spread out a second layer of chips and repeat the process. Then spread out a third layer of chips, using only about three-quarters the amount you used before, so there’s plenty of space between the new chips. Sprinkle on the remaining cheese, pork/chicken, and jalapeno. 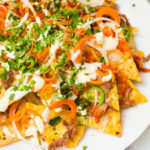 BAKE the nachos for about 10-15 minutes, checking them after 5 minutes and every 2 minutes thereafter to make sure the cheese is melting but the chips aren’t burning. When the cheese is all melted and the chips are slightly browned, remove them from the oven. DRAIN the carrot/daikon mixture and set it aside. TOP the baked chips with the carrot/daikon mix, the chopped cilantro, and the chopped scallion. 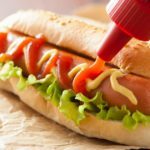 Using a spoon or a squeeze bottle, top the chips with mayo and sriracha to taste (I like to leave some areas without, for people who like it less spicy). Eat immediately! 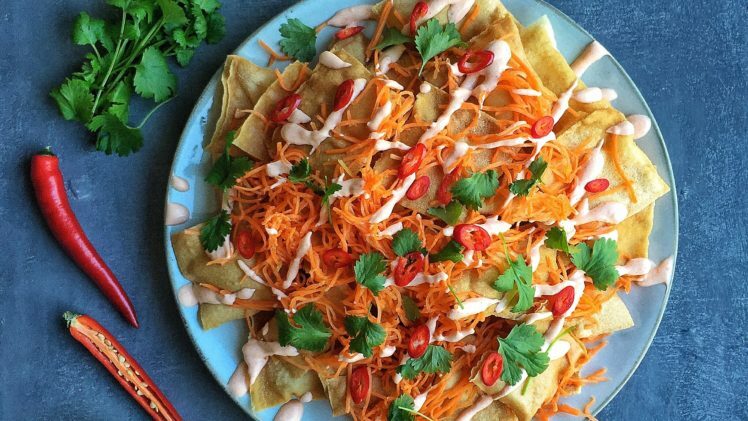 Nachos are best right out of the oven and only go downhill from there. Not that you’re likely to have leftovers, in my experience. I suppose you could eat these at other sports watching events or any seated occasion where you don’t really need your hands. I realize that excludes most parties, game nights, picnics, etc. What can I say, these are not easy to eat (neatly, at least), just easy to love.